“Nature must be absorbed through our eyes, ears, nose, and pores as well as our minds. Few of us need to be convinced that holding a slug or beholding a sky full of stars on a warm summer night differ mightily from virtual alternatives. It’s this direct experience that is so powerful in fostering emotional connections.” -Scott Sampson, author of How To Raise a Wild Child. Children are naturally inclined to utilize all their senses in order to process their surroundings. Give me a nickel for every parent who has looked over to find their toddler with a mouthful of dirt out in the yard, and I’ll buy everyone reading this a lifetime supply of Sesame Street-themed electric toothbrushes. 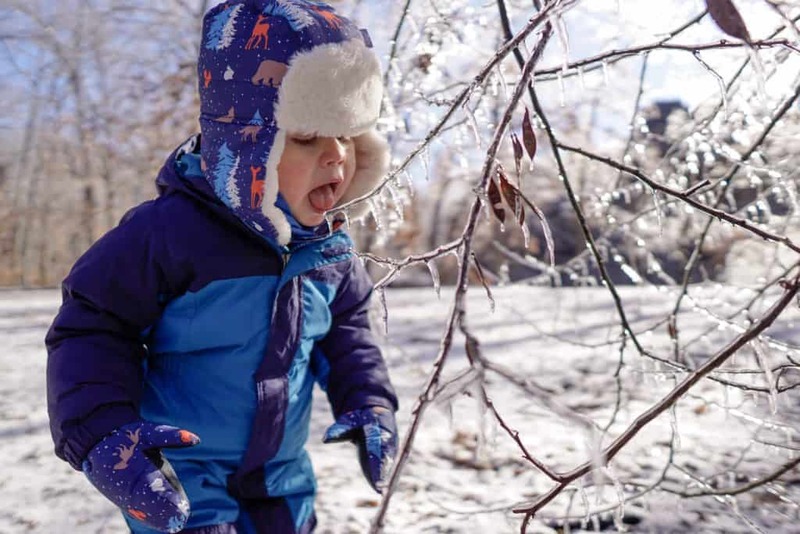 When kiddos are exposed to the wide world of nature their innate curiosity leads them to sample and explore by sight, smell, taste, sound, and touch. These hands-on experiences forge positive memories and foster an affinity for nature that can last a lifetime. Unfortunately, many kids today have limited opportunities to access nature in this way. Our society has become so industrialized and digitized that there is little place in the day-to-day for wildness. Recent studies, including one published in 2017,a have shown that increased time spent outdoors is actually effective in preventing the onset of myopia, or near-sightedness. Whenever possible, give your kiddos the opportunity to view the wide world surrounding them. Go someplace where they can expand their scope: see a vast mountain range, take in the Grand Canyon, absorb the uninterrupted horizon over the ocean. Or hit something a little closer to home: go up on a local vista or climb to the top of a fire tower. 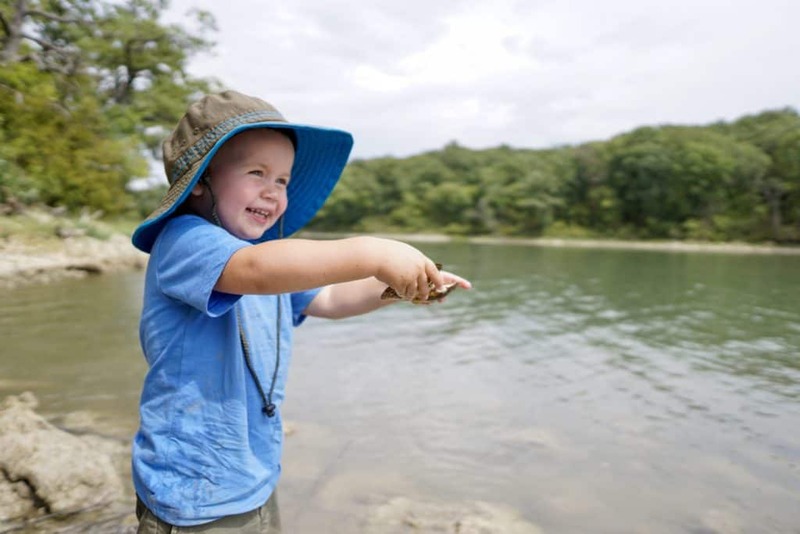 Ask them, “What is the farthest thing you can see?” Get them a pair of binoculars and point out land features, rivers or lakes, or any birds or wildlife. Think about the small things, too. If you’re out on a hike, give them a magnifying glass and encourage them to investigate the dirt, fallen logs, new sprouts. Search for bugs or ask them if they can see evidence of any other wildlife. Our sense of smell has such a powerful ability to transport us to a particular time, place, or memory. It possesses the strength to call us forward via a delicious, mouthwatering aroma or to send us fleeing from a room in the case of a particularly pungent odor! Yet I feel like most times the sense of smell goes overlooked or unnoticed. When out on a trail I am unconsciously taking note of the sights and sounds, but rarely do I register what information my nose is giving me. In the same way, I think our children can miss out on this subtle sense. They can benefit from us pointing out particular smells and asking probing questions so it becomes natural for them to actively engage their sense of smell. Point out the way the air smells different when it rains. Have them smell the grass, freshly turned dirt, a caught fish. Take a hike in springtime and see how many different wildflowers you can find. Have your kids close their eyes and see if they can learn to distinguish them by smell alone. Bring your dog along and draw your kids’ attention to how much your pup uses his own nose. 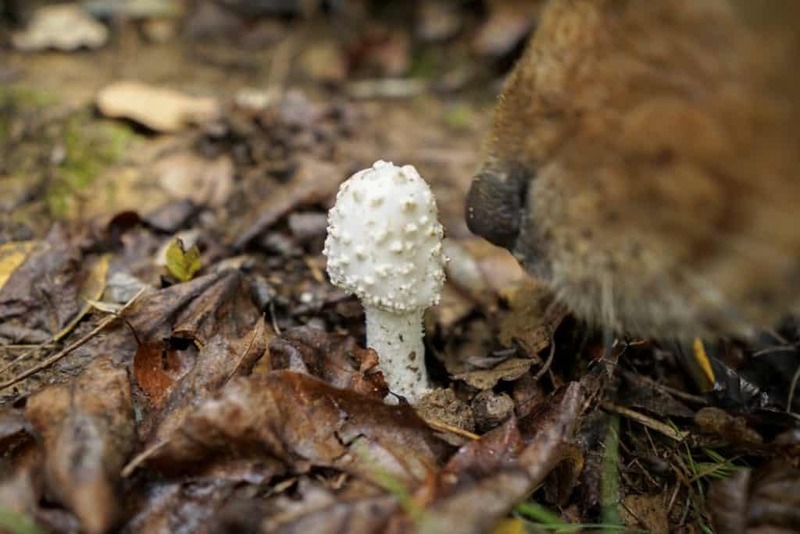 Did your dog stop to sniff a mushroom? Encourage your kiddo to sniff it, too! And let’s be honest, if your kiddo licks an earthworm, they’re unlikely to do it a second time—with or without a freak-out moment from mom or dad. So next time you’re outside, let them explore in this way, too! Let them taste rocks, dirt, grass. Go ahead and lick that icicle. Identify the wild edible plants in your area and try to find and sample them. Have a dandelion salad. Go to a pick-your-own fruit orchard or berry field and let them harvest their own treats. Or find a simple tea recipe that uses some of the weeds from your own backyard! I was once listening to an episode of All Things Considered on NPR when they visited the “One Square Inch of Silence” in Washington’s Olympic National Park. This spot has been designated the quietest place in the U.S. and is dedicated to preserving the sounds of the wilderness and keeping it free from intrusive noise. It’s founder, Matt Mikkelsen, estimates that there are fewer than 10 places in the U.S. such as this, which are free from human-made sound for more than 15 minutes at a time. Though that is just an estimation, it impacted me and makes me realize how precious the sounds of nature really are. When outdoors with your kiddos, encourage them to tune into the sounds around them. If you’re in your backyard, have them distinguish manmade noises from the sounds of nature. In the evening listen to noisy crickets or cicadas. If you’re out in the woods, point out the sound of wind in the trees or ask them how many different birds they can hear in one spot. For older children, you can practice identifying common birds in your area by their song. Walk along a river and point out the difference between the sound of ripples and the sound of a waterfall. If you’re by the ocean, listen to the waves. 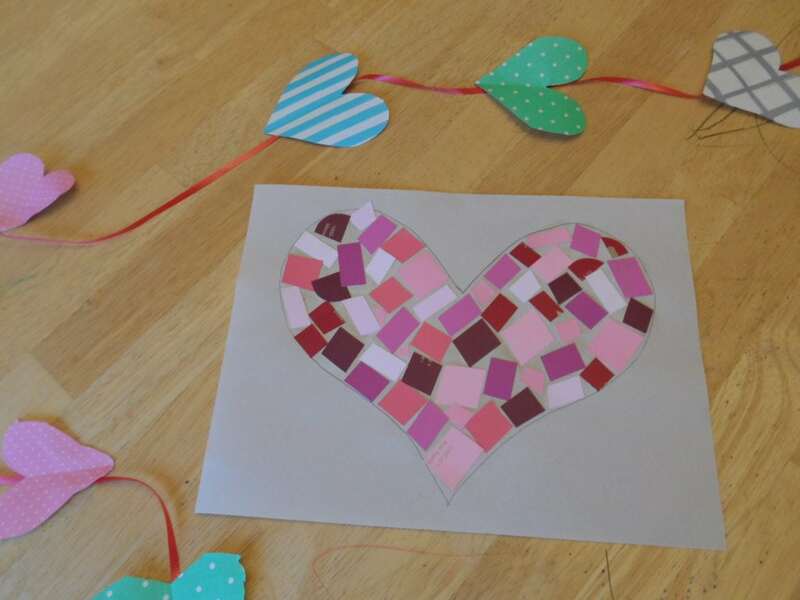 Ask your kids how different sounds make them feel—Excited? Intrigued? Relaxed? 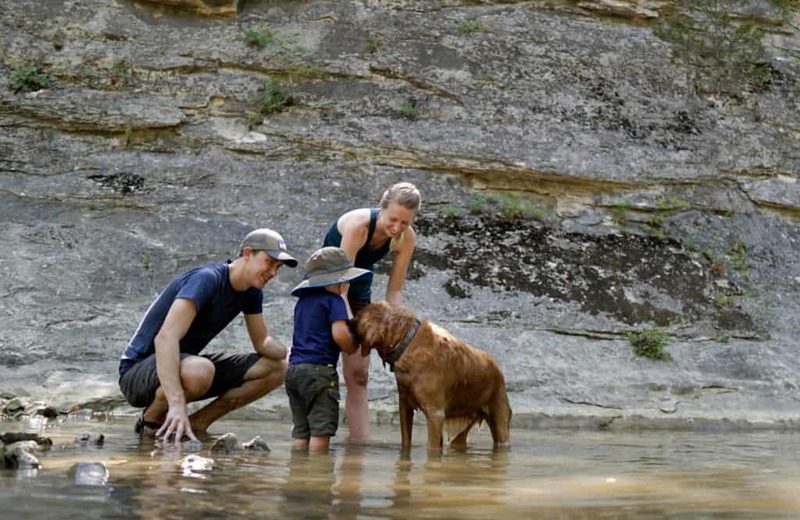 There is a spot on a river near our home where a shallow cave makes a nice cool, shady spot to break on hikes. 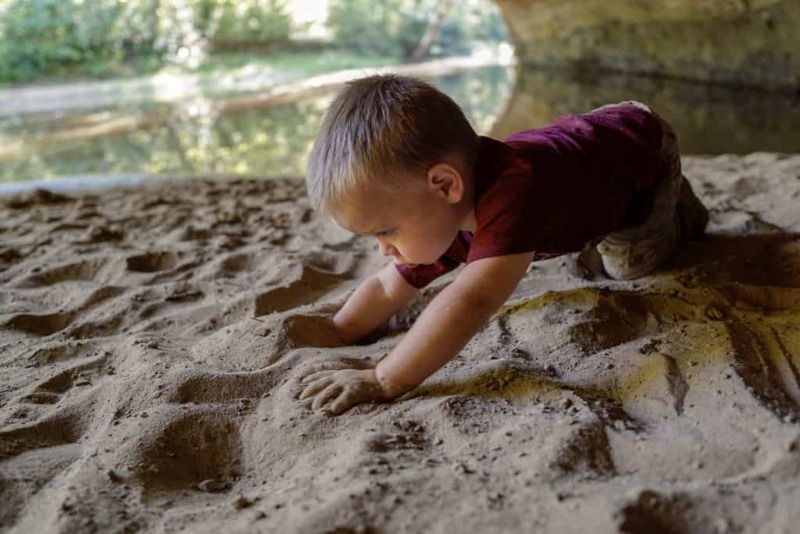 My son can spend ENDLESS amounts of time playing in the silty dirt that deposits there. Not just digging holes or making little mud pies, but full-on head-to-toe rolling around in that dirt. For hours. Finally, I bent down myself and dug my own fingers into the soil and suddenly I realized what was so fascinating about it! It wasn’t clumpy like garden dirt but was like the finest sand, smooth and buttery and flowed almost like the water itself. It was cool yet dry and easy to slide your fingers through. I kinda wanted to roll around in it myself, if I’m being honest. 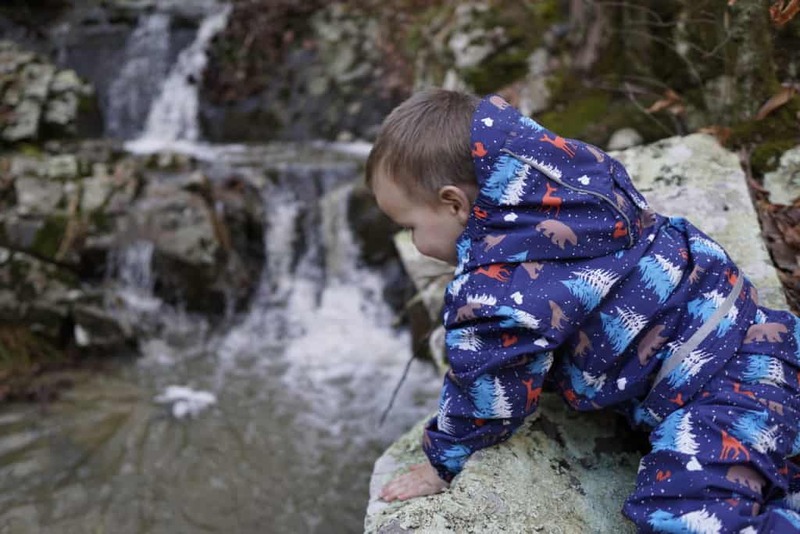 To engage their sense of touch, let your kiddos get elbows-deep in nature (literally). Bring them outdoors in the rain. On a sunny day, have them stand in a patch of shade, close their eyes, and then step out into the sun—can they feel the difference on their skin? Go swimming in a pond and let them feel the muddy bottom smush between their toes or the slick algae on the rocks. Modify a scavenger hunt to locate things that feel a certain way: find something rough, smooth, wet, prickly. Nature is full of loose parts. Ask them to pick things up, investigate, and describe the way things feel. 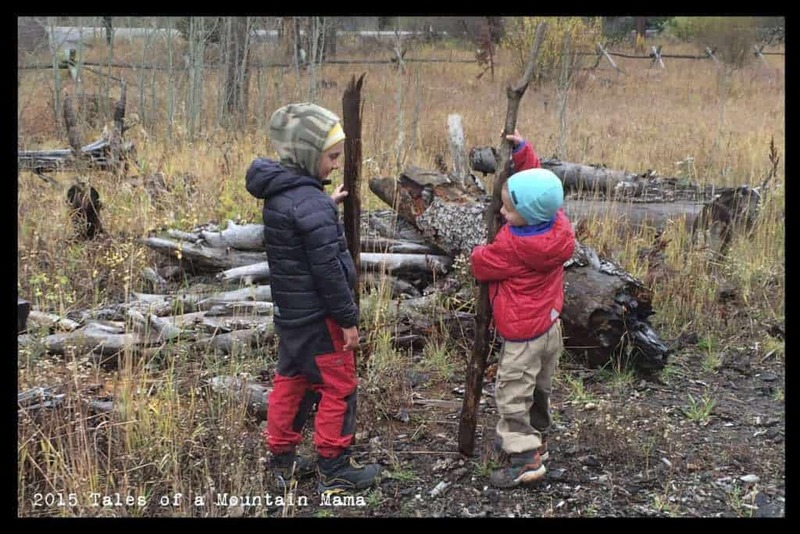 For older kids, check out this post on nature journaling by TMM team member Valerie, which outlines a great way for them to document their observations. 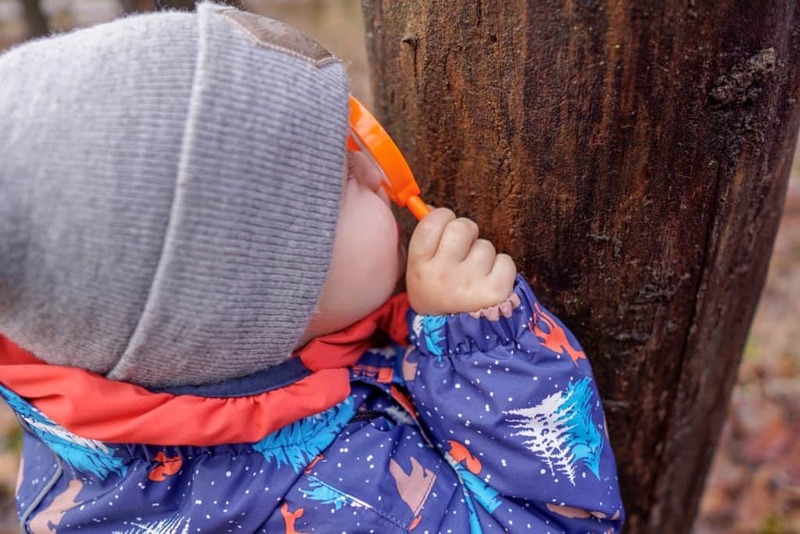 Through the engaging of all their senses, children can learn the full richness of nature, build memories, and develop a true love of the outdoors. This is the cornerstone of a healthy Wildhood. 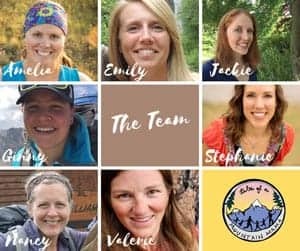 If you missed the first post in the Preserving Wildhood series from TMM team member Jackie, check it out here! 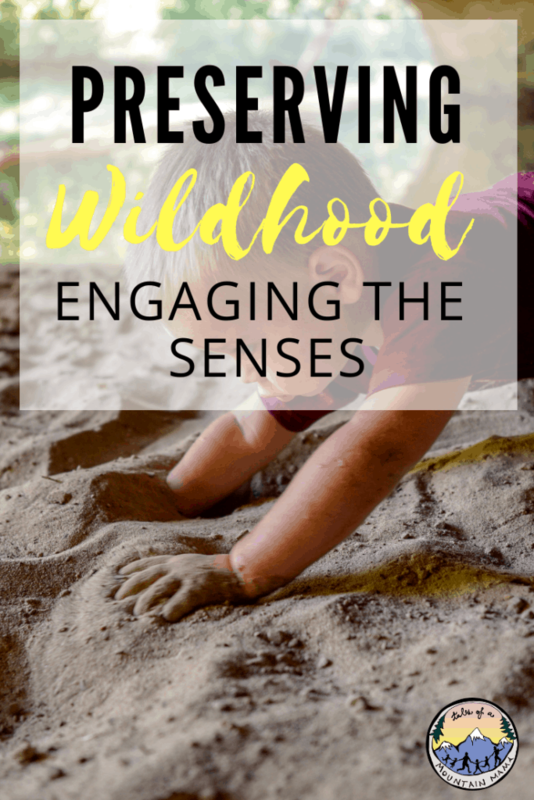 Also check out Valerie’s post in our Study of Nature series with some more ideas on how to engage the senses outside. a Xiong et al., Acta Ophthalmol. 2017 Sep; 95(6): 551–566.